If you've been charged with a Michigan Retail Fraud for the very first time, this doesn't make you a criminal or a bad person. I see clients on a daily basis who have have never been been arrested in their life. It's quite common that a good person will get themselves in a bad situation, which results in being charged with a Michigan Retail Fraud. When you first call me, I will want to know about your past, and if you have a criminal record. From there, I will want to know where this happened and who was involved. We will begin the fact gathering process together, and start to put together our comprehensive game plan. From there, we will order all of the police reports and evidence in your case. We may be able to track down video and audio, and if necessary will get a private investigator involved to build your various defenses. As a former prosecutor, I will begin working with the prosecuting attorney to explore all of your options. This will be a two part defense; one we will work to defeat your case either by a dismissal or a not guilty verdict at trial; two I will work on getting you the best possible plea deal on the table as a backup plan. You will have options, and together as a team, we will decide your best path for your case. I look forward to working with you. - the defendant intended to steal the property. Intended to steal means that the defendant intended to permanently take the property from the store without the store's consent. - this happened either inside the store or in the immediate area around the store, while the store was open to the public. If the value of the property is below $200, it is Michigan Retail Fraud in Third Degree, which is a 93 day misdemeanor. If the value of the property is between $200-$1,000, it is Michigan Retail Fraud in Second Degree, which is a one year misdemeanor. 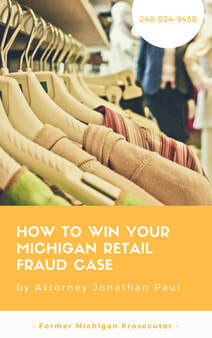 If the value of the property is more than $1,000, it is Michigan Retail Fraud in the First Degree, which is a felony. There are different variations for this offense for a defendant who attempts to make a false return exchange, and for price switching to a lower amount. These crime require slightly different elements, but have the same penalty. 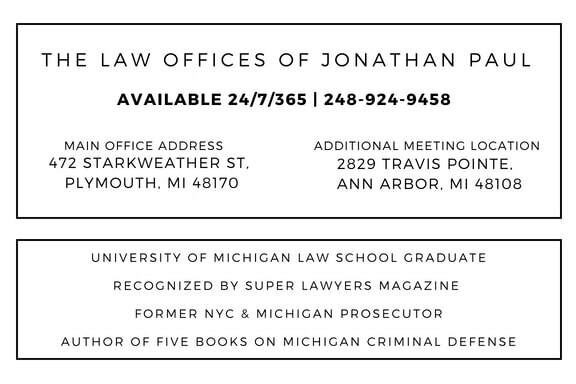 "Attorney Jonathan Paul wrote the book on Michigan Retail Fraud"